The Supreme Court has convicted V K Sasikala in the disproportionate assets case on Tuesday. Sasikala has been sentenced to four years of imprisonment by the apex court. Sasikala cannot contest elections for six years. The apex court, however, abated the appeal proceedings against late Tamil Nadu CM Jayalalithaa owing to her death on December 5 last year. Tamil Nadu Governor C Vidyasagar Rao gives appointment to AIADMK Legislature party leader Edapadi K.Palanisamy at 5:30 pm today. Security deployed outside Golden Bay Resort as a precaution in wake of today's judgement in DA case against. Sasikala's political career hangs in the balance on this verdict. 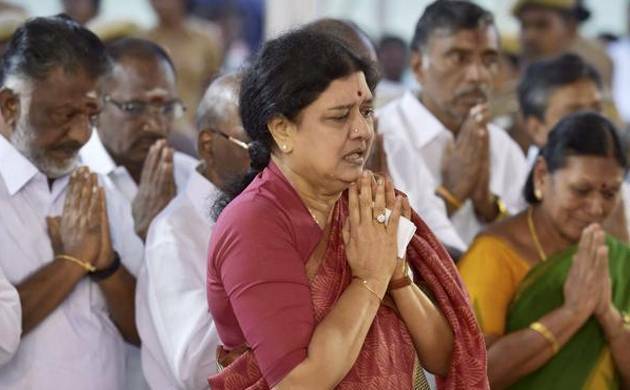 The case against her is very much on and the SC will give its findings on the angle of criminal conspiracy involving Sasikala, Ilavarasi and Sudhakaran. Sasikala is co-accused in a DA case against former TN chief minister and her mentor Jayalalithaa, along with Ilavarasi and VN Sudhakaran. In the case almost filed 20 years ago, Jayalalithaa was accused of misusing her office during her first tenure as chief minister during 1991-96 to amass properties worth ₹66.65 crores and depositing the amount in her proxy accounts. A raid in her Poes garden residence in 1997 recovered 800 kg (1,800 lb) silver, 28 kg (62 lb) gold, 750 pairs of shoes, 10,500 sarees, 91 watches and other valuables. However, she and all others were acquitted by Karnataka High Court in 2014. The case is now pending in Supreme Court.